For other uses, see Lifeguard (disambiguation). Piccadilly Cowboys, Donkey Wallopers, Tins, Tinned Fruit, Piccadilly Butchers. "Evil be to him who thinks badly of it"
The Life Guards grew from the four troops of Horse Guards (exclusively formed of gentlemen-troopers until the transformation of the last two remaining troops into Regiments of Life Guards in 1788) raised by Charles II around the time of his restoration, plus two troops of Horse Grenadier Guards (rank and file composed of commoners), which were raised some years later. The first troop was originally raised in Bruges in 1658 as His Majesty's Own Troop of Horse Guards. They formed part of the contingent raised by the exiled King Charles II as his contribution to the army of King Philip IV of Spain who were fighting the French and their allies the English Commonwealth under the Lord Protector Oliver Cromwell in the Franco-Spanish War and the concurrent Anglo-Spanish War. The second troop was founded in 1659 as Monck's Life Guards. The third troop, like the first troop was formed in 1658 from exiled Royalists and was initially known as The Duke of York's Troop of Horse Guards. The fourth troop was raised in 1661 in England. The first troop of horse grenadier guards was formed in 1693 from the amalgamation of three troops of grenadiers. 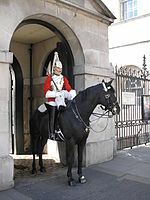 The second troop of horse grenadier guards was raised in Scotland in 1702. These units first saw action during the Third Anglo-Dutch War in 1672 and then at the Battle of Sedgemoor during the Monmouth Rebellion in 1685. The 3rd and 4th troops were disbanded in 1746. In 1788, the remaining 1st and 2nd troops, along with the two troops of Horse Grenadier Guards, were reorganised into two regiments, the 1st and 2nd Regiments of Life Guards (from 1877, simply 1st Life Guards and 2nd Life Guards). From then on (1788), rank and file were mostly formed of commoners (pejorative nickname: "cheesemongers"), the bulk of the gentlemen-troopers were pensioned off. In 1815 they were part of The Household Brigade at the Battle of Waterloo under Major-General Lord Edward Somerset. In 1821, the Life Guards under the command of Captain Oakes fired upon mourners trying to redirect the funeral procession of Queen Caroline through the city of London. Two civilians were killed. Though charges of manslaughter and murder were brought back on them, no guardsmen were prosecuted. In late 1918, after much service in the First World War, the two regiments gave up their horses and were re-roled as machine gun battalions, becoming the 1st and 2nd Battalions, Guards Machine Gun Regiment. They reverted to their previous names and roles after the end of the war. In 1922, the two regiments were merged into one regiment, The Life Guards (1st and 2nd). In 1928, it was re-designated The Life Guards. During the Second World War, the Life Guards took part in the Normandy landings and the advance through France to liberate Brussels. In 1992, as part of the Options for Change defence review, The Life Guards were joined together with the Blues and Royals in a 'Union', not an amalgamation, forming the Household Cavalry Regiment (armoured reconnaissance) and the Household Cavalry Mounted Regiment (ceremonial duties). However, they maintain their regimental identity, with distinct uniforms and traditions, and their own colonel. In common with the Blues and Royals, they have a peculiar non-commissioned rank structure: In brief, they lack sergeants, replacing them with multiple grades of corporal. On ceremonial occasions the Life Guards wear a scarlet tunic, a metal cuirass and a matching helmet with a white plume worn bound on the top into an 'onion' shape; the exceptions to this are the regiment's trumpeters, who wear a red plume, and farriers, who wear blue tunics and have a black plume. In addition, the Life Guards wear their chin strap below their lower lip, as opposed to the Blues and Royals who wear it under their chin. On service dress the Life Guards Officers and Warrant Officer Class Ones wear a red lanyard on the right shoulder, as well as a Sam Browne belt. The Life Guards, as part of the Household Division, does not use the Order of the Bath Star for its officer rank 'pips', but rather the Order of the Garter Star. Life Guards performing ceremonial drills on both horseback and with vehicles in London's Hyde Park. ^ The regiment maintained the fiction of separate regiments until 1928, receiving in 1927 two separate sets of Standards with different (but almost identical) battle honours emblazoned. ^ Revised combined list issued May 1933, omitting from emblazonment "Passchendaele" and "St. Quentin Canal" of the 1st Life Guards. ^ a b Awarded jointly to The Life Guards and Blues and Royals, for services of Household Cavalry Regiment. ^ Tincey, John; Embleton, Gerry (1994). The British Army 1660-1704. Great Britain: Osprey Publishing. p. 43. ISBN 978-1-85532-381-0. Retrieved 5 June 2008. ^ a b c d e f "The Life Guards". Ministry of Defence. Retrieved 3 May 2014. ^ "The Rank Past of the Mounted Guards". Trooping the Colour. Retrieved 15 June 2015. ^ "The Household Cavalry: Order of dress and explanation of the items of clothing". Retrieved 3 May 2014. ^ "Ranks and Insignia for Infantry Officers through out the Victorian Era". Victorian Strollers. Retrieved 29 July 2016. ^ "The Household Cavalry: Standards". Archived from the original on 3 February 2014. Retrieved 3 May 2014. ^ a b "1st Life Guards". regiments.org. Archived from the original on 22 August 2006. Retrieved 27 September 2016. Baker, Granville (1934). Old Cavalry Stations. Heath Cranton Ltd.
Dawnay, Major N P (n.d.). The Standards of the Household Cavalry. Gale and Polden, Aldershot. Lloyd, W (1992). Challengers and Chargers: A History of The Life Guards 1945-1992. Leo Cooper. Roberts, Andrew (2005). Waterloo. Harper Collins. Roynon, Gavin (2004). Massacre of Innocents: The Crofton Diaries 1914-15. Sutton publishing. Watson, J N P (1997). Guardsmen of the Sky. Michael Russell. White-Spunner, Barney (2006). Horse Guards. Macmillan. ISBN 978-1405055741. Wikimedia Commons has media related to Life Guards (British Army). This page was last edited on 25 February 2019, at 03:10 (UTC).